There are a lot of discovery apps out there. This year at SXSW discovery was the biggest space represented by new app startups at SXSWi. So now with hundreds of discovery startups popping up all over the place, the features, UI, UX and user benefit are the biggest parts to insuring the success of a discovery startup. Kentucky startup WhyWait has all of those elements in pace. WhyWait is about serving the user the best local restaurants and then letting them know when things are going on at those places. WhyWait features event calendars, menus, specials, happy hours and even provides restaurants the ability to use push notifications to send out great deals to users. The startup has even incorporated local events in addition to events at restaurants like Karaoke night, live music and big specials. Kentucky has a flourishing scene of startups. They have an active Startup America Partnership and several hubs like Northern Kentucky (and Cincinnati), and Louisville. WhyWait started in Bowling Green and recently moved to Louisville. What is your WhyWait and What do you do? 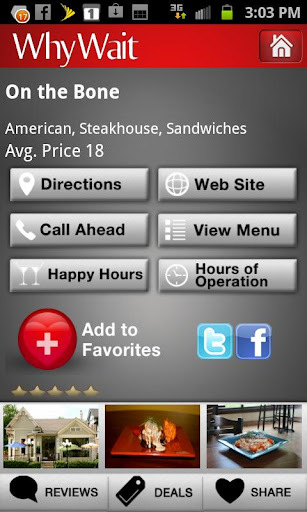 WhyWait is a free restaurant app for iPhone and Android devices. WhyWait gives restaurants control over the content. They can post deals, happy hours, pictures, menus, events, and more in real time. WhyWait has a list of restaurants (Excluding Fast Food), a happy hours button that shows you all active happy hours as well as descriptions, and an event calendar. Our event calendar has both events that restaurants post like live music or trivia night as well as local events that WhyWait post. WhyWait also has a favorites list. A user can favorite a restaurant and put that restaurant into their list of favorites. Restaurants can send push notification to people who have favorite their restaurant to promote deals, events, or specials. Restaurants also have the option to show their wait time. This is done by the restaurant. Through a tablet, phone, or an existing pc at the restaurant, they can log in and update a wait time. One summer while out on a construction site pouring concrete, he decided to take the leap. In 2011 Eric decided to devote all of his efforts into transforming the concept of a mobile app for restaurants into an actual business. With no prior knowledge or experience in entrepreneurship Eric turned to research for everything, including how to start a business plan and prospectus with which to pitch to investors. His efforts were more than successful; only 8 months later he launched the initial beta test in the Bowling Green market where identified a major void in the market to which WhyWait will be the solution. In his leisure time, Eric enjoys playing music, eating out and spending time with friends and family. Jon Matar, 26, currently holds two significant titles at WhyWait and for good reason; Jon has noteworthy background in the finance and management industry as well as an apparent niche for community and corporate networking. Born in Sand Diego CA, Jon lived most of his life in Bowling Green, Kentucky until he graduated from Greenwood High School in 2004. Jon graduated from The University of Kentucky where he was an active member of Sigma Phi Epsilon and graduated with Bachelors of Business Administration with a double major in both Finance and Management. After graduating, he worked his way up in the finance industry; Jon soon became a respected Loan Administrator for the Bank of Lexington, and was also licensed in health and life insurance. In the summer of 2011, Eric Littleton contacted Jon about a business idea he had about a mobile application for restaurant wait times. “As the idea evolved, so did the concept. It went from a wait time app to a marketing platform for restaurants that gave app users real time local information. I quit my job at the Bank of Lexington in October of 2011 and haven’t looked back.” Looking forward, Jon hopes to start the new wave of how businesses communicate with their customers; he foresees an immense technology crossover that gives consumers the most accurate and real time information, allowing businesses to portray themselves the way they want to. In his leisure time Jon enjoys eating out, playing golf, and browsing the internet. I never heard anyone say they were part of a “startup” in Bowling Green KY. There was no real culture there even though we were located in a small business accelerator. In researching other companies, one of the most compelling and driving incentives to getting the business off the ground was hearing success stories. These businesses were not run by industry titans, they were started by a regular person with an idea. In other areas, these companies were celebrated within a respective culture and we found that to be more so in Louisville. There have been several entities in Louisville that has led us to both investors and other networks we have benefitted from. Answering the age old question, “Where should we go?” When someone is making a decision on where to have lunch or dinner, or what’s going on this weekend, or let’s grab a drink after work, WhyWait helps answer this question. The information on the app is real time information that restaurants can update as often as they would like. When a company is in many cities, it’s hard to keep content updated and fresh. WhyWait allows restaurants to control the content so a user always knows that what they see is accurate. Our biggest challenge has been to deciding on the direction of our product. With every product release we experienced feedback that went into the conceptualization of future versions. Determining what our product was going to do and where we fit in the market has been our most difficult challenge. What we have coming next. We are adding a lot of new features and a better user interface to the app. We have been working on this for several months. Some things that we are doing have not been done before so we are keeping them very quiet for now. When people look at the app they are impressed and say this looks good. In the back of our minds all we can think about is “just wait.” Just wait for the next version; it is night and day to what we currently have. The next step is to keep gathering feedback from users and restaurants and improving the product. At the same time, expanding to new markets. Keeping momentum and improving the product. Getting our name out there and getting downloads. After our next scheduled development release we will be launching regionally/nationally.